In a press release issued today, Verizon said that its new online community forums have proven to be a great place for customers to connect about service issues and even to reach the customer service department. According to the release, one of the growing base of super users is Justin McMurry of Keller, Texas, who describes his involvement as growing from a natural interest in Verizon’s FiOS TV and FiOS Internet services. Formerly a technical support expert for many years at a major technology company, McMurry said he enjoys solving problems and answering questions for others who visit the Community Forums in search of real-time feedback from fellow customers. According to ajc.com, Savannah Republican, Sen. Eric Johnson now has as Twitter to update the public on Georgian affairs of the state. Johnson has sent Twitter texts almost daily from the legislative session. On March 12, he tweeted from the Senate floor that his proposal to name tax-dodging lawmakers had come up again, and passed. ‘It allows for quick communication with a target audience,’ Johnson said in a telephone interview to ajc.com. What do you think of politicians using social media to connect with their audience? Did Obama pave the way for this sort of communication? Have you had a chance to vote in our latest TMRE poll? Have you seen more of your MR budget being allocated to shopper insights? Ratings and reviews lie. Simple, subtle lies, but lies all the same. And I suspect most people will never know. The first time I realized what a con ratings could be was when I visited Dubai. I was travelling with a group of friends and one of them booked the hotels. It was quite a surprise to hear we’d booked into a 5-star hotel for what seemed like a 3-star price. It transpired that this was not because my friend had negotiated a great deal, but because hotel stars in Dubai are dispersed as liberally as banking bonuses. Dubai is the land of the 7-star hotel and I’m afraid that has nothing to do with the Burj Al Arab being better than the 5-star Carlyle in New York or Cipriani in Venice. Thankfully, one of the great things about online consumer-generated Ratings and Reviews is their ability to bypass the bias that could come from the reviewer benefiting from the review. At least that’s true so long as the reviews are honest and any bias is stated. If enough ‘ordinary’ people are writing the reviews then they ought to be trustworthy. And I am sure they are. However bias does still remain and so do a couple of other hidden lies of ratings and reviews. ’76% use online reviews to help make purchase decisions’ (Forrester Research, 2007). Concerns about negative ratings and reviews Despite all the evidence, we at FreshNetworks still run into uncertainty when discussing ratings and reviews with online retailers. Especially amoung UK-based retailers, there first reaction is often nervousness. It’s an understandable concern, however it’s baseless. When it comes to online reviews for products consumers are far more generous than you might think. Assuming ratings are on a scale from 1 to 5, we’d expect 2.5 to be the average score for reviews. With this in mind, it’s rather impressive that the average score accross the web is actually more like 4.3 (BazaarVoice, 2008). Even if you do get negative reviews, there is strong evidence that negative reviews are good for retailers ‘ preventing returns and giving more credibility to websites. Woot is a great example of this. So how to ratings and reviews lie? There are four key ways in which ratings and reviews lie. There may be more but these are the ones that jump out at me. 1. There is no ‘zero’ score. The third and final purchase bias is post-purchase rationalisation. This bias comes from our tendency to retrospectively justify our decisions as rational ones. We humans prefer to feel that we made good selections not poor ones. So if you ask me whether or not I liked a product that I just spent my hard earned money on, you’re going to get a positive review more frequently than you get a negative one ‘ we like to feel our past choices have been rational and well made. It is the sum of these biases that results in an average five-star review of 4.3. That’s a long distance from 2.5. With the Community 2.0 event coming up in May, we’re going to introduce you to another keynote speakers for this year’s event. Community 2.0 is May 11-13 in San Fransisco, California at The Palace Hotel. 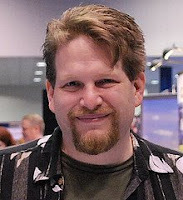 Today, we’re featuring keynote speaker Chris Brogan, the co-founder of PodCamp and President of New Marketing Labs. Join us in San Fransisco on Wednesday, May13th for Chris Brogan’s keynote speech, Bringing Our Own Dial Tone. Don’t forget, if you’re in the New York City area, we’re kicking off Community 2.0 festivities early with a networking event April 16. Click here for more information and to RSVP. Any customer knows what it’s like to call a company just to be routed through directory after directory. VoIP-News recently published a list of ways to get around waiting for a customer service representative. Memorize prompts. If you’re unfortunate enough to have call about the same issue on a regular basis, memorize the prompts that work for you. Press everything. By pressing multiple numbers, you can trick systems into thinking you’re on a rotary phone ‘ or that you’re crazy. Either way, you’re in. Press any digit repeatedly. You may land in the wrong department, but you’ll end up at beginning of line when you’re transferred. According to NYTimes.com, Salesforce.com, the Web-based customer relationship management service that says it has more than a million subscribers, has legitimized the tweet as a cry for help by incorporating Twitter into its system. Now, when customers gripe on Twitter, Salesforce can automatically log a support request, and then post a human response back onto Twitter. Zappos, and Comcast are just a few of the companies using Twitter for customer service. Do you think more companies will follow suit? We’d like to hear your thoughts. March’s The Market Research Event LinkedIn Roundup is here! Read the newsletter here. If you haven’t had a chance to join our Market Research Event LinkedIn Group, join now! Each month, we reach out to our LinkedIn group, providing news, information and discounts related to our community. If you’re not a part of this group click here to join today! Click on the link below for this month’s edition of the Community 2.0 Newsletter. Don’t forget to update your group settings to receive announcements, get the latest discussions and news pertaining to our group.